The Police Association of South Australia (PASA), established in 1911, has a membership drawn exclusively from sworn members at any rank and cadets of the South Australia Police (SAPOL). Membership of the Police Association is voluntary. Management of the Police Association rests with an executive elected from the entire membership. The executive consists of the President and Secretary, who, following election, are released by the employer to work for the Police Association on a full-time basis, and 10 committee members who serve in an honorary capacity. The executive meets monthly. PASA negotiates enterprise agreements on behalf of its members and seeks variations to the Police Officers Award when appropriate. PASA has been negotiating enterprise agreements with government since 1995. PASA lobbies government and opposition politicians on member’s behalf about a range of issues that affect them. PASA has been instrumental in convincing governments to recruit more police and amend legislation. Beyond negotiating for salary & conditions PASA provides members with life insurance under a group life scheme. For media enquiries or for comment from President Mark Carroll email media@pasa.asn.au or call (08) 8212 3055. 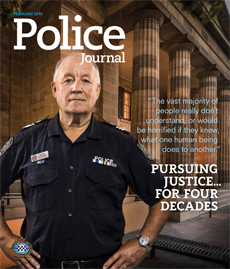 The Police Journal is distributed to members, politicians and the media every two months.